The most obvious thing to say about Locke is that it takes place entirely inside of an automobile. 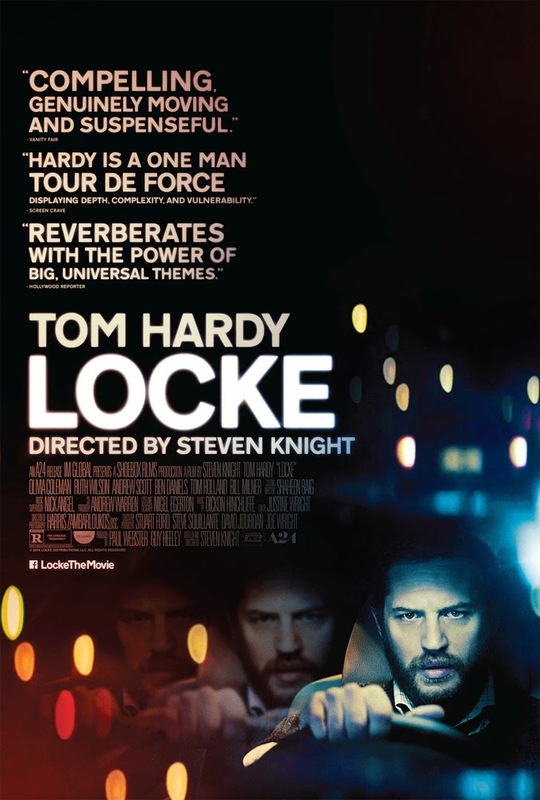 There is only one on screen character, Ivan Locke, played by Tom Hardy. Everyone Locke interacts with appears over the phone, acting by voice over. The ninety minute drive, which takes place in real time, will be one of the most eventful of Locke's life. His career and his relationships will be altered forever upon arriving at his destination, and Locke himself will not be the same man. At the beginning of his excursion, Locke seems prepared for the changes that are about to transpire, or at least resigned to the fact that his life will indeed be changing. Locke works as a construction firm and is on the cusp of one of the biggest projects ever to be built in England. Unfortunately, the project is in crisis. The concrete pour for the foundation is poorly planned out and despite being scheduled to start construction the next day, the mix isn't done, permits haven't been signed and the rebar is the wrong size. The bosses in Chicago are not pleased. The site manager (Andrew Scott) is freaking out and possibly hitting the sauce. If that weren't enough, Locke's personal life is about to change forever. He has been keeping a secret from his family for months, and his impromptu trip to London is his attempt to rectify the situation. His sons' are disappointed he is missing family night to watch the big soccer match on TV. His wife (Ruth Wilson) is understandably distressed by Locke's lies and behavior. Locke ultimately desires to be a good man. He wants to build the building, fix his London problem and return home to his family. No easy task. His mistakes, those both honest and otherwise, will be punished. Ultimately this film is a a showcase for Tom Hardy, the film equivalent of a one person play. Keeping an audience engaged for 90 minutes of conversation is minor miracle, and films like these always succeed or fail on writing and performance. One person shows like this have never been an overtly visual medium. Writer and director Stephen Knight keeps the film interesting as possible by using fades, reflections and ever changing camera angles. It's overall a good looking film, filled with blues and yellows. While it will never match the visual awe of epic cinema, the claustrophobic camera work works as an exercise. Thematically, it matches the mind state of Locke. Alone and in motion. Locke will not be everyone's cup of tea. Microscopic attention spans are not catered to here. Those looking for a different type of film than this week's superhero serial have found it. Locke is subtle, quiet, intimate and intense. Adventurous and attentive filmgoers will be rewarded.